Most wide format printing engines have the potential to produce excellent output quality, both in terms of resolution and colour gamut. But to achieve the highest possible quality day in and day out, printing companies must make preparations before the device is installed to establish prime conditions for its performance. All large format printing engines are checked by installation technicians to make sure that they are placed on a stable and even surface. However large format flatbed printers will especially benefit from a specially prepared and super-even, solid and extremely level floor. This is to ensure the exact placement of droplets on the substrate at speed, because any slight unevenness of the floor will be transmitted to the printhead when it travels quickly over the surface. If the droplets aren’t placed with micrometre precision, the image quality in terms of sharpness will be compromised. It’s a bit like trying to drive a car fast on an uneven surface, the vibrations will be most disturbing and impede overall performance. Digital printer manufacturers can advise on what they consider to be an ideal surface and how to prepare it prior to installation. The three main external components which can have a negative effect on image quality are vibrations, and incorrect levels of heat and humidity in the ambient environment. So, in addition to optimising the floor conditions, any additional causes of vibration need to be addressed and the temperature and humidity kept stable over time in line with the manufacturer’s recommendations. 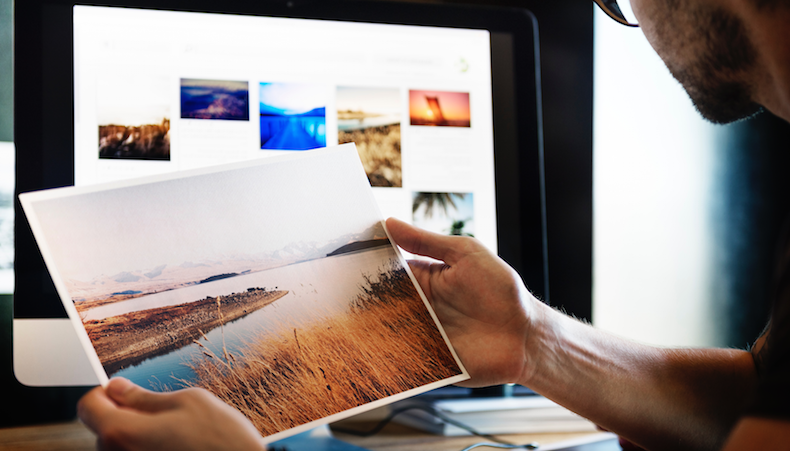 As a rule of thumb a digital printer works best at the same temperature and humidity that we humans prefer, around 20° C and a humidity of about 50-60%. Temperature and humidity are, to some extent, interrelated, so try and keep at least one, and ideally both, of them stable. The humidity should be well over 30%, or both staff and printing devices will suffer. Staff will suffer from dried out air passages which can be unhealthy in the long term, and printing devices will show a tendency to produce banding if the humidity is too low. At low levels of humidity there is also the risk that the negative effects of antistatic will start to impact. When installing a digital large format flatbed printer, like for example this Mimaki JFX200-2531, you need to make sure the floor is totally flat and even, and that you can keep both temperature and humidity at optimum levels. One of the advantages of digital wide format production is the versatility it offers with regard to the substrates that can be used. But this also poses a challenge, since every substrate needs customised and optimised output settings to ensure top quality, especially at speed. And if you use UV-curable inks you must make sure that the curing process is fully completed, or you will not only have problems with smearing ink, but the ink can be toxic when not fully cured. The amount of ink laid down on the substrate should also be optimised to guarantee the maximum possible colour gamut. On the other hand, you must avoid laying down too much ink, since this will cause all kinds of problems, not only longer drying or curing times, but might also create negative visual effects such as bronzing for example. Bronzing results from excess ink so that instead of, for example black, you get a “bronze” look in the deep shadows, where pigments in the ink create a top layer that looks like bronze when drying slowly and/or incompletely. Once all the factors that make up a proper calibration of the printer, based on specific combination of ink and substrate, the data should be saved for future use in a colour library. This library, built up over time, should contain all the necessary metadata needed to repeat specific types of jobs and to achieve exactly the same result again and again. This is sometimes called a Colour Profile, but it is more than the actual ICC profile for a given substrate. An ICC profile is a data set that characterises colour input and output devices, or colour spaces. The Colour Profile in a production system context encompasses all the parameters needed to produce an optimised and repeatable printed result, including information about what test form should be used when calibrating, using a particular substrate in a particular printer. Updating and finetuning these Colour Profiles is a never-ending process, but key if you want consistent top quality prints from all of your devices and for all types of substrates. To avoid operator errors and reduce the time used on training and maintenance, you should strive to use one single workflow system for all devices, like for example ONYX Thrive shown here, instead of a different RIP for every single device. It’s all well and good to say that for every substrate and printer there should be a specific setting available somewhere in the system to be reused when needed. But the reality is that at most printing sites there is a range of digital printers of different ages and makes, and they are often delivered with their own type and model of print server, or Raster Image Processor (RIP). So from the operator’s point of view the challenge is that every RIP has its own user interface, similar perhaps to another, but still different. This can unfortunately increase the risk of operator errors, and so will add costs to the business because it demands more training and maintenance than if one single workflow system or RIP system, is used for all the digital printing devices on site. This might not be achieved immediately, but should be a goal to achieve over time. Using a single workflow system for all the devices makes both training and operations more efficient, and reduces the risk of mistakes and human errors. It also helps when establishing a central library of Colour Profiles, and so will help enhance the overall quality as well as help increase productivity and efficiency. There are few other sectors within the graphic arts that evolve as fast as the digital wide format printing sector. This means that there is constantly new technology on offer, both in terms of printing devices, inks and substrates. To have the best technology available for the job at hand, and to be able to offer the highest quality possible for your customers, at speed and efficiently, you need to keep a close eye on the continuous developments of printing technologies. So, stay informed, visit trade shows, read the trade press and test reports, since this is also part of striving to maintain and increase print quality.